I can roll out and decorate cookies with the most die-hard of my Midwestern relatives. In fact, I may put them to shame, since my attention to detail while making Christmas cookies a few weeks ago annoyed even my Mom. Is it weird that I'm feeling proud about that? She has high standards, you guys. But no level of frosting-fueled rage--er, late-night decorating perfection can compete with a tool true confectioners and professional chefs will soon have on hand. 3D Systems aims for your gut with the first two professional-grade printers targeted for sugar and chocolate confection-making only. 3D Systems plans to roll out the single- print-head ChefJet for a price somewhere under $5000 and the four-head, professional and color (!!) version for something under $10,000. Both will be available "in the second half of 2014," according to the company. Wondering how they do it? It's kind of genius. You know how simple syrup is nothing more than sugar and water, boiled? That's all that's happening with the ChefJet. The machine lays a thin powdery puff of fine sugar, then a single inkjet-style print head paints over the sugar with a sheer layer of water. It's sugar, water, sugar, water, one thin layer after the other until the layers reach the thousands and an intricately designed sugared confection ready to top a wedding cake sits pertly inside the printer box. These printers can also make chocolate-flavored creations with the same method, this time using a blend of cocoa powder and sugar. The more expensive ChefJet Pro's four print heads work in the same fashion but add color using cyan, yellow, and magenta dye (the fourth printhead extrudes clear layers rather than black). The stunning examples at 3D Systems' 2014 CES booth showcased the vibrant colors the printer produces, and they were way cooler than the white logo-encrusted sugar cubes the company showcased at an industry conference in San Jose, CA a few months ago. The designs shown at CES were far more intricate. There's no telling what true food artists will dream up with these printers, and that's really the point here. Having a dedicated, mass-produced printer for this sort of food preparation is one of the coolest things about 3D printing, and it's a leap forward for the industry as a whole. That is, assuming you weren't already into 3D printing for the ability to build that random plastic car clip you lost instead of having to buy the stupid thing for an inflated price. 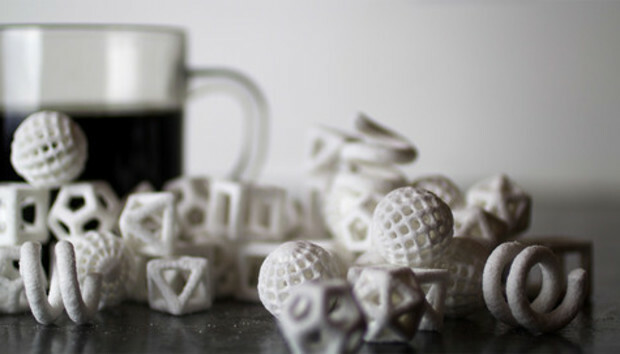 3D systems hopes to ease the transition from royal icing by hand to crafting machine marvels by loading the printer package with software that's easy to design with. Now if only I could justify the cost--and a rich confectioner relative I never knew of suddenly bequeaths me one out of kindness. Then my cookie making prowess would have no bounds--bwahahaha... er, maybe I'm not ready for that much power just yet.